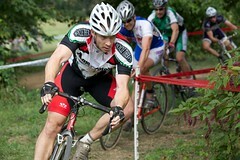 The 2010 edition of Charm City Cyclocross included two days of gut-wrenching, chest-burning racing. The festivities kicked off early Saturday morning with a new course layout at historic Druid Hill Park in Baltimore, Md. More twists and turns than the usual set-up but no less demanding or fun. The course still included Charm City Cross landmarks such as the staircase, natural barrier and double-sandpit. Here at CXHairs, the 2010 game plan is to again try and record the races we attend using two cameras. One camera is on the helmet and a second, rear-facing camera is on the seat-stay. Instead of trying to fit both camera views onto the screen at the same time, as I did for a handful of races last year, I am going to post two videos. They will be close to identical in music and length. The only difference is that one will be the forward-facing view and the other the rear-facing view. For music this year I hope to once again tap into the great bands supported by Mid-Atlantic labels. If you hear something you like, check out the labels website and buy some music. Charm City Cyclocross had me diving back into the archives for a couple of my favorite tracks from Exotic Fever Records alums. For this race we have tracks from Pash and Eulcid. Not to highlight my dumb mistakes, but you may notice on the video I had a 2:00 a.m. typo and misspelled Eulcid. My apologies to the band. My goal is to get that changed and reloaded soon. OK, YOUR START LOOK MORE BETTER THIS TIME SINCE FROM LAST YEAR. GOOD JOB AT COUCH MAYHEW.